Demantra® and advanced Supply Planning Work Area (SPWA) are demand management and supply chain management tools provided by Oracle®. These products are integrated with the Oracle E-Business Suite (EBS) and Oracle Advanced Planning Suite (APS) (which are part of the Oracle Advanced Supply Chain Planning (ASCP)) to best leverage Demantra demand management and supply chain management functionalities. 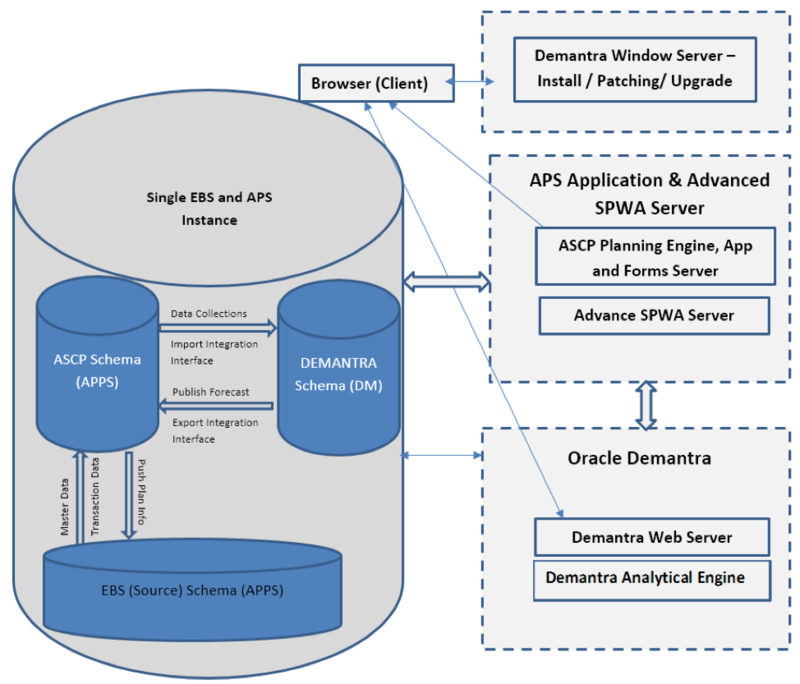 This blog covers Demantra and SPWA configuration with Oracle EBS and APS Value Chain Planning (VCP) from an Oracle database administrator (DBA) and architecture perspective. It also provides high-level installation steps for Demantra and advanced SPWA. ASCP is a comprehensive, internet-based planning solution that decides when and where supplies (for example, inventory, purchase orders, and work orders) should be deployed within an extended supply chain. Demantra is a best-in-class provider of demand management, sales, and operations planning, as well as trade promotions management solutions. Advanced SPWA allows you, as a planner, to view plan data or plan inputs by using pre-seeded layouts or user-defined page layouts. These layouts enhance your productivity because they allow you to see an aggregate analytical view with guided analysis and can also create multiple page layouts with real world business processes and analysis. 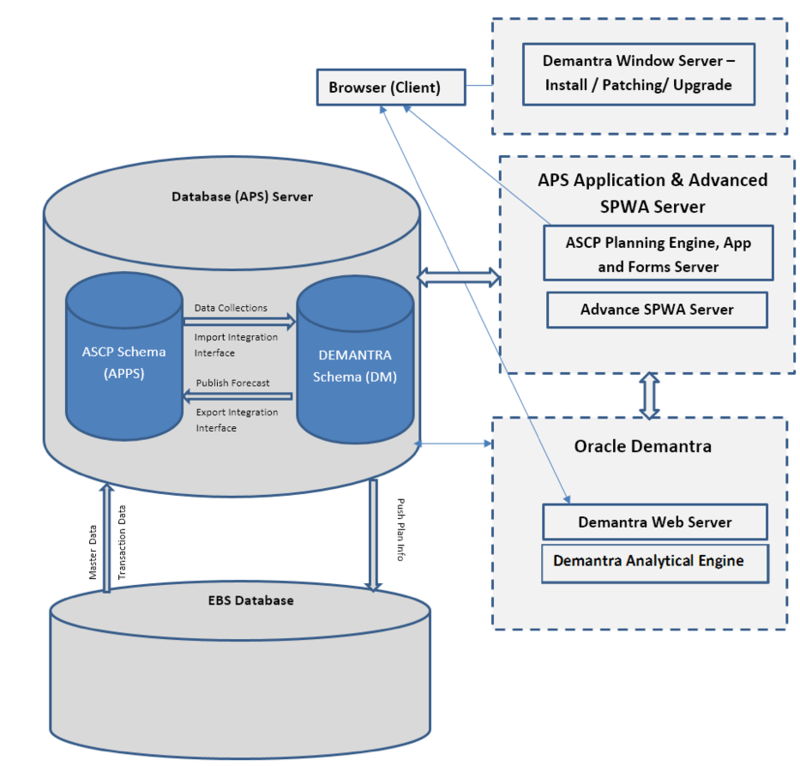 Note: The integration of Oracle Demantra and Oracle APS and ASCP is out of scope of this post. Demantra also supports legacy systems by using flat-file loads, but this post focuses on using Demantra with Oracle APS and ASCP. The single instance can include Oracle EBS, ASCP and APS, advanced SPWA, and Demantra. This instance must be a supported combination of EBS and Demantra releases. Oracle support can provide an up-to-date list of certified versions for integration. With separate instances, the APS instance includes APS and ASCP, advanced SPWA, and Demantra. The EBS database is on a separate instance. The destination instance must be a Demantra-certified version of APS. The installation of the Demantra application is a multistep process. Note: You need to install Demantra on a Microsoft® Windows® server because the Demantra Installer and Demantra administrative utilities (Business Modeler, and Demand Management Tools, and so on) are supported only on Windows platforms. The Demantra Installer on Windows servers creates the database schema (in an APS database), and you need to use the administrator tools to configure the application. After you install Demantra on the Windows server, the process transfers the application to the Unix® servers that host the Demantra Web server and Analytical Engine server. Use the following high-level installation steps to install Demantra version 12.2.6.2. Prepare the database for Demantra by creating a 16 K block size table space (tbs) in the APS database (DB). Install the 64-bit Oracle Database 12c (12.1.0.2) client on the Windows server. Install Demantra version 12.2.6.2 on the Windows server. Install Java® JDK 8 64-bit on the Linux® server (Demantra web server). Install Weblogic® 12c (12.1.3.0.0 ) on the Linux server (Demantra web server). Configure the domain for Demantra deployment. Configure the JDBC data source. Enable the archived real path (archived-real-path-enabled). Create the Demantra WAR file on the Windows server. Install Java JDK 8 64-bit and the Oracle client on the Linux server (Demantra Analytical Engine). Copy the engine tar file from the Windows server to the Linux server. Create the Engine data source file. Configure the Demantra Analytical Engine on the Analytical Server with a new Oracle Wallet Repository. Start the Analytical Engine starter. Use the following high-level steps to install the Advanced SPWA (Planning User Interface (UI)). Note: The following WebLogic installation must be separate from the WebLogic installation that comes with EBS applications. Install J-Rockit or install the required Java Developer Kit: JDK 1.7.0_80+. Install the WebLogic server 10.3.6 version 11gR1 (10.3.6). Install ADF 11.1.1.9.0 on top of WLS 10.3.6. For the Install location, select the WebLogic server home (10.3.6). This is very important. If you incorrectly select the WebLogic server home that comes with the version 12.2.x technical stack, then you will have to redo all the steps from the beginning for the VCP Application Development Framework (ADF) UI. Apply the ADF patches for the planning UI. Create the ASCP domain and admin server. Create the ASCP managed server. Apply the JRF - Enterprise Manager. Create the JDBC data source. Set up the Metadata Services (MDS) repository. Start the admin server and the managed server. Copy $MSC_TOP/patch/115/ear/PlanningUI.ear from APS (VCP). Deploy $MSC_TOP/patch/115/ear/PlanningUI.ear and start the planning application. Apply ADF patches for the Fusion middleware. Set the profile option MSC: ASCP Planning URL at the site level in the APS instance with the Advance SPWA URL. ASCP provides database-based holistic planning and optimization that rapidly and significantly improves supply chain performance. Demantra enables you, as a planner, to sense demand in real time, improve forecast accuracy, and shape demand for profitability. The SPWA enables you to view plan data and inputs by using pre-seeded layouts or custom layouts. Enhance planner productivity because you can see an aggregate analytical view with guided analysis. Make informed and faster decisions because you can share unified supply chain planning information across the enterprise. Improve supply chain performance by analyzing all aspects of a supply chain and develop optimal plans across the virtual supply chain. Take advantage of a demand-driven organization with higher service levels and sales, more satisfied customers, and lower inventory and distribution costs. Learn more about Rackspace application services.